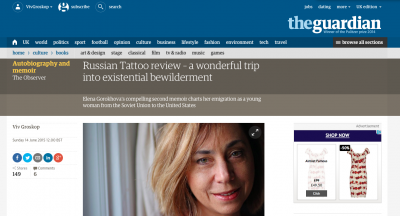 I really loved Elena Gorokhova’s memoir Russian Tattoo, about her new life in America, having grown up in Soviet Russia. I reviewed her first book, A Mountain of Crumbs, in 2010 and the only complaint I had was that it stopped so abruptly: it had vivid descriptions about her childhood but then she seemed to give up as soon as she got to the US. Obviously that was because it could make a whole other book. And now it has. Both highly recommended. Also reviewed recently: Elizabeth Day’s Paradise City in which four story lines collide in contemporary London. And Judy Blume’s extraordinary novel In the Unlikely Event, about three plane crashes that happened within the space of three months in Elizabeth, New Jersey (new Newark airport), in the 1950s, based on Blume’s own experiences.